Once "Haarmanns Vanillinfabrik" and "KarstadtQuelle" and now "Symrise" and "Arcandor": Over the past 160 years, the conventions underlying the naming of German companies have undergone a rapid change. While in former times it was often the founder's name that appeared in a company's name, today we find that factitious fantasy names have taken their place. But that's not all: In general, ames have become shorter, more resonant, less transparent, more international. In addition, they are increasingly characterized by deliberate violations of grammatical rules, as, for example, some completely unrelated word fragments are combined to form new names. "The practice of naming companies has dramatically changed," claims Fabian Fahlbusch of Johannes Gutenberg University Mainz (JGU), while pointing out that the choice of the right name for a company is of vital economic importance. Fabian Fahlbusch, who majored in German linguistics and minored in Business Economics, investigated the changes in the names adopted by 160 of the leading companies listed on the Frankfurt Stock Exchange (Dax, MDax, SDax, and TecDax) since their foundation. Because these had undergone nearly 300 renaming processes, Fahlbusch ended up looking at a total of 450 names. "The most striking thing is undoubtedly the fact that fantasy names are used in almost 80% of cases today," says Fahlbusch. These names are being used instead of the once very popular personal company names. "The idea of using the name of the company's founder as a guarantee of experience and quality has had its day. Instead the objective is to try to link the company with positive associations by using an invented factitious name," the linguist explains. A typical example of this is the way that "Haarmanns Vanillinfabrik" has been renamed "Symrise," a name presumably supposed to invoke warmth (sympathy) and ascent (rise). In addition to the changes to renaming conventions, Fahlbusch identified seven other criteria that document the ongoing metamorphosis occuring in this field. It turns out that more and more companies are using special typeface characteristics to distinguish themselves from their competitors. The frequency of use of these so-called "attractors," such as the consistent use of capitalization throughout a name, has increased 14-fold since they were first employed. There has likewise been a significant increase in the use of foreign language elements, reflecting continuing globalization. Components of English words are most popular, but Greek and Latin elements are also still being used, something that Fahlbusch postulates is supposed to indicate a degree of reliability and trustworthiness. At the same time, names are now on average three syllables shorter or have been shortened by more than one word. Many major changes have taken place since the 1970s, particularly with regard to the phonetic aspect of names. "It used to be the case that no one paid any attention to the melodiousness of a name. However, over the past 40 years, the phonetic characteristics of company names - just like those of personal forenames - have been becoming softer and lighter," explains Fahlbusch. But names should not become too soft or they will have an overly sentimental effect. All in all, the linguist has observed a significant, continuous evolutionary trend, which can be explained by the ongoing efforts of companies to give themselves a name that is as individual and ideal as possible. But do all these efforts to convey the image and reputation of company through its name have the desired effects on the recipients? What form of name is most effective? And do names influence investment decisions? To find answers to these questions, Fahlbusch has initiated a new investigation: In a representative survey, participants aged 14-89 years from seven age groups were asked to evaluate 105 company names, among other things. Initial results indicate that the older subjects, as expected, respond to confidence-generating elements in the names of banks, while both old and young alike prefer creatively factitious names for computer manufacturers. The response to a question regarding investment decisions shows that the "right" name would attract approx. 70 times more capital in an initial public offering than the "wrong" name would. "This shows what an immense importance names have," confirms Fahlbusch. Using eight criteria, Fahlbusch can now demonstrate how to generate a positive company name in practice and, as a result, he gets many inquiries, particularly from start-up enterprises. "It is all too easy to make silly mistakes when choosing a name. It is advisable to be careful and to review one's choice carefully." As a research associate, Fabian Fahlbusch is also involved in the "German Surname Atlas (DFA)" project funded by the German Research Foundation (DFG) and supervised by Professor Dr. Damaris Nübling of the German Department of Mainz University. He has already conducted research into the naming of companies while preparing his Magister thesis and intends to continue investigations in this field to obtain his doctorate. 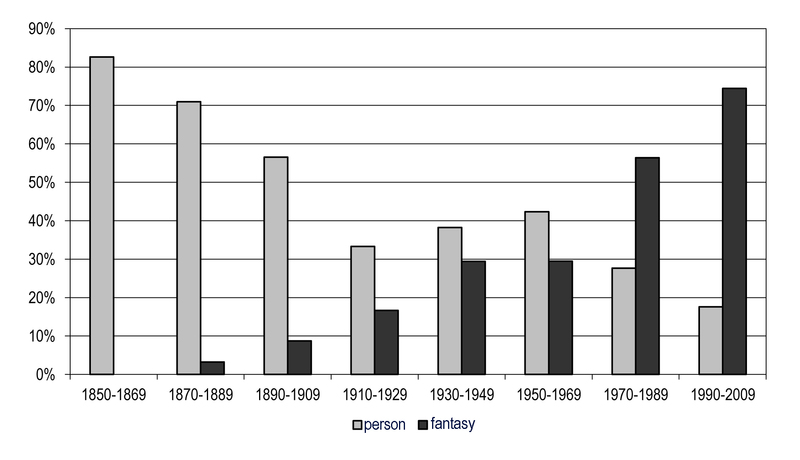 Relative percentages of names generated using the factors "person" and "fantasy" in each given period.